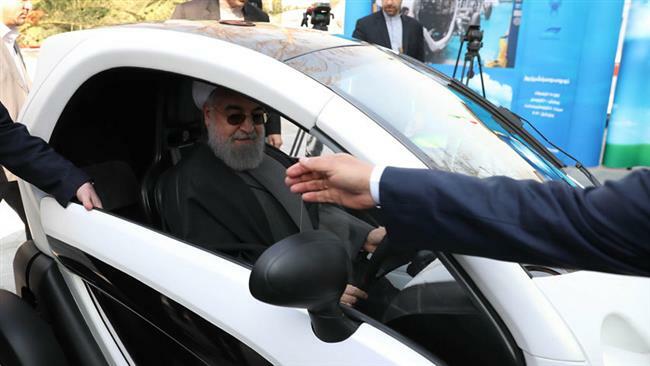 Iranian President Hassan Rouhani has test-driven a domestically-manufactured electric car on the National Clean Air Day. On the sidelines of a cabinet session on Wednesday, Rouhani took a tour by some of his ministers to check the products of three knowledge-based companies manufacturing electric cars and motorcycles. The Iranian president was briefed on the capabilities and quality of the products, including the two-seat electric car Yooz, produced by the Islamic Azad University of Qazvin, as well as two electric motorcycles manufactured by two other research centers. The Yooz car can travel at a speed of 80 kilometers per hour. It can also hold 15 kilowatt-hours of electricity per 100 kilometers and it takes two and a half hours to charge. During his visit, Rouhani praised the products and underlined the need to boost their quality and safety. Iran has named January 18 as the National Clean Air to draw attention to the problem of air pollution gripping the country’s big cities. Over the past few years, Iran’s megacities, including the capital Tehran, have been suffering from heavy air pollution blamed largely on floating particles from car emissions. Pollution especially increases in the country in winter by a temperature inversion and a lack of wind.